This weekend I started school. have amiably agreed to show me a thing or two. Can I tell you how stoked I am about that? but the integrity with which they do business. In my book, that stands for a lot. is the maintenance of diligent records. as well as any pertinent information for future sowing. Today's lesson got started with the planting of okra. A southern staple, it is one of the most popular crops they sell. as there are established plants on another part of the property. so that he is able to fulfill his customers requests most of the year. This was the first time I'd seen okra seeds. I'd never had occasion to plant it. for spacing and planting depth. if you're trying to germinate something for the first time. With experience, alterations may be made. Lynn uses this tool for smaller seeds . then just plunged them down until my fingers hit soil. A quick patting down, and we're good to go. that was recently pulled out of the pots. It must have taken up the whole depth of the container. I was amazed to see how thick and bulky the stems were. It's truly astounding to see what comes of a tiny seed. After planting, they were well watered in. and much of his gear has a lifetime warranty. That's hard to come by these days. We also reseeded some beans that had not germinated. Each task is completed with such tender care. It's no wonder the food tastes so good. I'm on the waiting list for these gorgeous leeks! so they are not prevalent in most grocery stores. Can't wait to make the first pot of soup with these babies! Another job we tackled was removing the spent pea vines. We cut them down and cleaned up the pots a bit. He's got new plants already started here in the back. These will be ready for harvest in the next couple of weeks. I have found that my noontime salad is not the same without them. peas are not such a bad vice. The lettuces keep them company. a love affair going with Romaine for the longest time. my heart belongs to it. as they are more than willing to accommodate their customers. but I was unaffected by the temperatures. make their way to you. Farm school was back in session on Saturday. It was about 20 degrees warmer this week. Seedlings waiting their turn to be transplanted. will find a new home soon. so I look forward to witnessing them come into their own. Would you look at these beauties? and he is being handsomely rewarded. Faye raises a large variety of amaryllis plants. What a lovely sight in the garden. The peas should be ready for harvesting by next week. My lunchtime salad just ain't the same without 'em. Wish you could taste how sweet and juicy these lil' buggers are. We worked on the leeks today. although I haven't yet tasted Lynn's offerings. He has his own magical mix for growing. because his crops are so healthy and abundant. then added a bit more soil mix. to make some delicious homemade soup. but most of the lessons consisted of observation. Lynn's been busy creating more space for growing. The first stop was the kale/okra/Swiss chard area. Here's how it looked a couple of weeks ago. The cinder blocks were moved to make a more expansive formation. without all of the stooping required from a traditional garden plot. including the okra that we planted last week. The reseeded snap peas are doing well. these are ripe for the pickin'. You know I came home with a bagful! Alas, the eggplant are just about spent. I've been allowed to pick my own from the remaining crop. We tore out the plants with withering fruit. that will be ready for harvest within weeks. The leeks are growing strong. Can't wait for the first bite of these tasty treats. With herbs like this, who needs ornamentals? but this plant is worthy of space in the garden. It's quite a set up. as well as protecting plants from a freeze. much easier and more efficient. It's used to keep spiders and yukkity-yuks from clogging up the line. 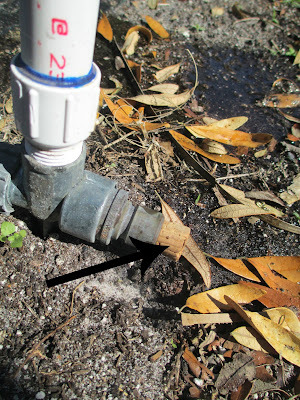 This filter works to keep the top of the sprinklers clear. All of these measures keep the system running smoothly. These sprayers cover a whole lotta territory. A newfound love of mine. Here's the high-tech way to take care of that. Let me tell ya, life is good. This week a lot was covered at Farm School. but it's a wonderful place to be. I'm finding that mindfulness is a constant discipline here. That's something that I can use a lot more practice doing. First thing we did was check on the kales, beans and maters. aiming to keep out unwanted critters. 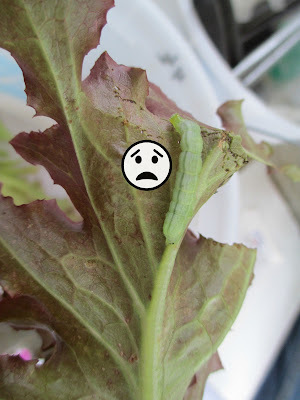 The kales, especially, are susceptible to worms. and producing clusters of fruit. We checked on the delectable peas. and give more support to the crops. We also reseeded a few rows. I'm happiest when my hands are in the dirt. The stuff grows like gangbusters! It's a great addition to a salad and bolsters one's iron sources. even though some of it is flowering. The upcoming eggplant looks healthy and vibrant. Two varieties of leeks are being grown. It'd be interesting to sample each and compare their taste. The dill seed is almost ready for harvesting. in such an amazing package? I learned about the importance of investing in quality equipment. We were going to sow seeds and Lynn showed me his method. One of the crops we're starting today is Roma tomatoes. and he was gracious enough to oblige. so he's got quite a stash. We're all about the recycling here! His secret mix is loaded into the trays and leveled. Only non-GMO seeds are used here. they are put in using tweezers for precise placement. One seed per cell is all that's required. then placed in this double rack system. A good sprinkling of water will foster germination. A plastic lid is placed on top to preserve moisture. How blessed to be learning from someone so skilled. could be so well adapted to the application I have in mind. I'm picturing Maple Hill and all of its beneficiaries. Saturday was beautiful here in Central Florida. and enjoy being so close to paradise. Read about my mentors here. to spend as much time as possible outside in nature. I had noticed a smattering of orange on my way up the drive. This is a loquat tree. I'd read about them, but never seen one in person. He described it as peach meets plum. All I know is that it was delicious. Juicy, not too sweet and a marvel to behold. Maters as far as the eye can see! These bad boys will soon be ready for harvest. We took a look at the beans. Some had noticeable wind damage. Transplanting seedlings is on today's agenda. to prevent weeds from growing and robbing plants of nutrients. The transplants are placed in the center hole. right in the center of the plastic ring's hole. Digging around the nail provides the perfect-sized hollow to accommodate the new seedlings. to nestle into their new home. 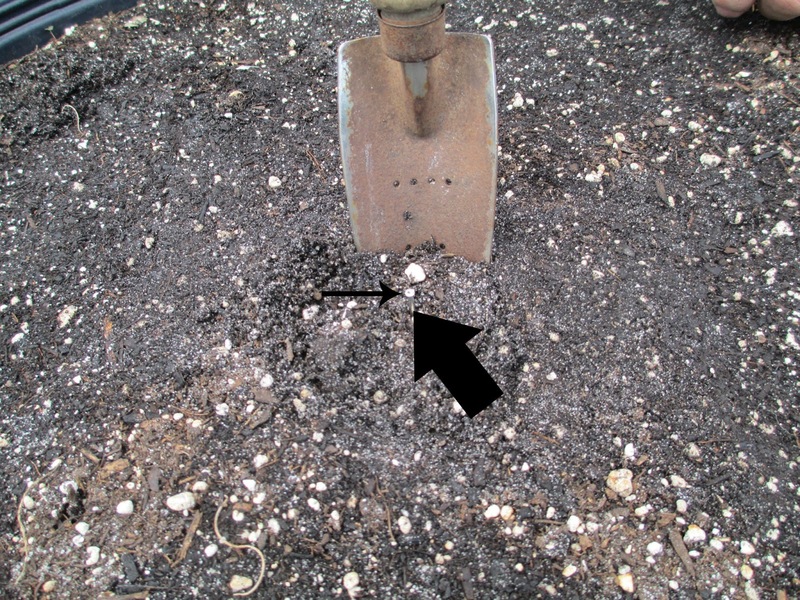 flush with the surrounding soil. The black ring is placed back on top. help to keep the plastic in place during windy conditions. We also had time to get some eggplant transplanted. I asked Lynn about the fading bottoms of these peas. even though the bottoms look spent. 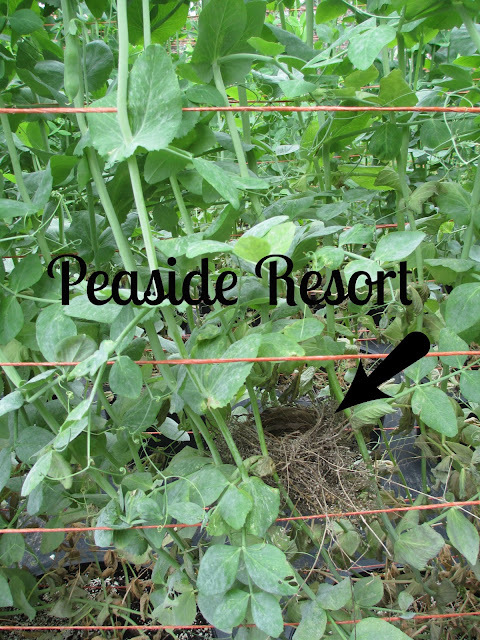 Here are peas planted a little over a month ago. And others planted a few weeks later. I gotta say this is one of my favorite samplings each week. Succession planting keeps customers happy. where they are most used. Hope you are enjoying the lessons you are gifted with today. in your neck of the woods. Some pretty amazing things happen here. will be gracing our supper table. These beans are a bush variety and need no staking. These beauties just keep comin' right along. These are pretty far along. Today we're planting sweet millions. It's a cherry tomato variety. when other tomatoes are long since compost. Notice how long the stem is. Wait 'til you see what we do with this gorgeous specimen. Everything is started from seed. Those are some mighty healthy looking roots there. All the lower leaves are stripped off of the stem. Lynn says that you really can't hurt the plant at this stage. Seems brutal, but this man knows his stuff. the plant is placed waaaaaaay down in the hole. until it's almost where the topmost leaves begin. Buried and snug as a bug. so as to saturate the roots. If the roots are healthy, the plant should be too. We checked on the eggplant that were recently transplanted. I adore the bloom on this eggplant. A feast for the eyes as well as the soul. This one ended up in my take home bag. That's nothing short of amazing. A new crop being tried is the zucchini blossom. Pea tendrils dance as they make their way up the trellis. This is the day I've been waiting for. I get to sample this magnificent creature. Lynn even allowed me to harvest my own! Just grab at the base and pull, baby, pull! I'm 5' 4", and these were nearly my height. that will go into my order for a lettuce mix. Everything is suited to the customer's preferences. because I start to drool uncontrollably. God sure does good work. Hope you enjoyed Farm School today. The time I spend here is so centering for me, so calming. It nurtures my very being. Enjoy this day and and all of its gifts. The days here are getting warmer in a hurry. our usual check on what's growing. The beans should soon be ready for harvest. They are looking healthy and strong. that things are on track. are suffering from some type of worm or other critter. 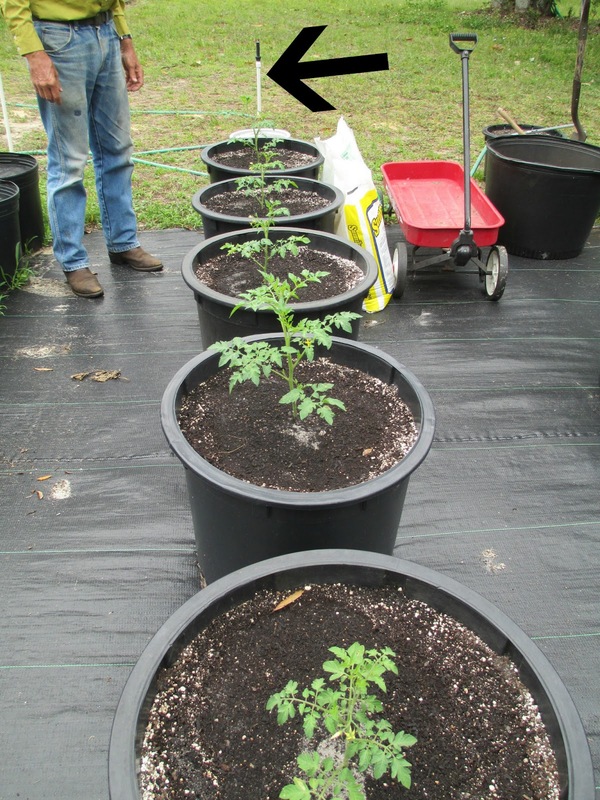 Faye & Lynn used diatomaceous earth on the crops. Several of these beauties are starting to turn color. There is ample sunshine and circulation in this part of the garden. and an assortment of herbs. A sea of pea vines. The squash blossoms are lookin' good. We worked on transplanting some eggplant this week. Lynn also reiterated how important it is to keep accurate records. even though my garden isn't a quarter of his. Gorgeous blooms are provided at every turn. The neighbors' draft horses sometimes come over for a visit. One of my requests this week was parsley. and whizzed in the food processor. I freeze it in jars so that I always have some on hand. Lynn let me cut my own bunch. I wish you could smell this stuff! I also got to harvest my own eggplant and beets. What's better than pickin' your own food fresh from the garden? Lynn has all these tricks up his sleeve. These buckets have handles with a plastic piece that cracks over time. as the metal handle digs into your skin without the extra support. so that it serves as a cushion. He prefers the one on the left. although the set up is a bit modified. helps me to feel that I can be too. is that they are accomplishing an extraordinary feat. Providing food for others is a remarkable achievement. Being willing to teach your craft to others is phenomenal. but much of it has already taken seed. the more I want to know. I told Lynn that's the sign of a true teacher. quite a bit cooler than I had expected. Sometimes Lynn has more energy than he knows what to do with. I had no sooner exited my vehicle when the first lesson began. as she was procuring an order for lettuce. she was able to spot these two troublemakers. They are called cabbage loopers. and tomato plants, by chewing the leaves. Lynn shared with me that Bt can be used to control them. Some of the lettuce has bolted. They don't like the heat. They remind me of Christmas trees. But of course, they're much tastier. Some of the cilantro has bolted as well. Lynn told me that it was 97 degrees in the sun last week. he's trying a new variety. This one is supposed to be slow to bolt. I just love how he experiments with new varieties and methods. I actually got to sow these. Sendin' a little love down with each seed. Some trays of brand spankin' new seedlings are coming right along. They have a bit of shade under an umbrella when needed. There is always something new brewing here. to prevent the birds from accessing the fruit. Unfortunately, one lil' rascal got into the other side and took a taste. The ends had to be covered as well to prevent any more losses. they are growing strong and vigorously. Flags are placed near ripening fruit to make spotting them easier. Hopefully, we'll be bringing some of these home next week. Grilled tomato and cheese here I come! It's unreal how much fruit is on each plant. It's like a major 'mater wing-ding goin' on in there! They can hardly contain themselves! The star of the show this week is the beans. an array of tender, sweet goodness. They've got beans comin' out of their ears! it sure is pretty to look at, no? were feeling the effects of the heat. to gently mist the plants until they looked a bit livelier. that nurtures the tomato crops in this garden. weeds have no chance of interfering with the crop's growth. 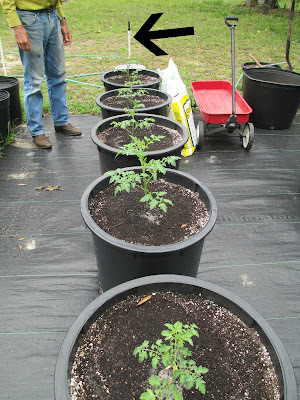 Today we were filling pots for new tomatoes going in. The container to the right holds virgin soil. He fills it about a third of the way up the pot. Amendments are added, then more topsoil. with our last layer of amendments. is then filled in with additional topsoil. The first additive is lime. This can be found at any big box store or hardware store. It helps the 'maters get a great start. in the bottom third of the pot. The lime goes on top, about 3/4 of a cup. then use a cultivator to work it in well. and then fill the pot up to the brim with topsoil. A good day's work and a happy gardener. Someone else has been busy on the property. so snug and nestled in their home. Here's Momma takin' care of business. There really is so much to see here. just to snap shots of all the unusual plant life. Aren't they the most delicate things? This is called the Confederate Rose. Faye said that it's in the hibiscus family. here's what it looked like the next day. Mother Nature is a wonder. A lot was accomplished today. There is so much more to learn. doing what rings your chimes! Do something kind for Mother Earth today! Farm School is back in session. It was another busy day with lots to do and see. Ah, yes, another day in paradise. and sampled one of his delicious morsels. but the critters cannot penetrate the barrier. which protects the plant from pests. Plenty of blooms on these sweet things. It was time to cage these babies. This is a cutworm. Nasty critters. when they surface from just beneath the soil. We pulled out all this lettuce that had bolted from the heat. The pots were tidied and prepared for another crop. Lynn explained how he gets his fertilizer from a local company. He uses this on most of his crops. It's got the right mix of minerals that his plants adore. than what you might find at a big box store. It lasts a good long while. Some of the more exotic plants were in bloom. This is called a king's mantle. The contrast of the purple and yellow is striking. This is the queen's mantle. but what a difference in texture and form. This is a sausage tree which is native to Africa. We will visit this one again when we can show you what it produces. This plant is a mystery even to Lynn. it seemed like the blooms were plastic or vinyl. What a wild sense of humor God has. because I was meant to travel this path. and all that God provides. This weekend it's felt more like summer. it's all a part of farming. of being a Florida gardener. when others are gearing up for winter. It's all a trade off. We're back and ready to enjoy all of God's beauty that abides here. as Faye and Lynn had a successful morning at the farmer's market. A breezy 91 degrees in the shade. Our mission today was to get these pepper plants staked and caged. Several have grown so quickly that they are now leaning. Lynn has many uses for these particular cages. He keeps them handy near the garden where they will be utilzed. The stakes are repurposed from Lynn's citrus plants. so he reuses them for other crops. gets two or three of these rods placed around the stem. It's a delicate process, as peppers can be extremely sensitive. that no ties are needed. After staking, the cages are ready to be placed. A small puncture is made in the black plastic where the cage legs sit. This material is self-sealing, so the process must be done quickly. The beauty of this product is that it eliminates the need for weeding. as well as a few hot varieties. and being a Southern crop, the demand is high. as well as scenes created by Mother Nature's helping hand. It's all beautiful, wonderful and fosters tranquility. Another family has been busy. They were noticed a couple of weeks ago. made their debut sometime last week. Momma was not far away. It felt good to accomplish a unified goal. See ya next week for another lesson! Farm School is really heatin' up. It's still spring, but feels more like summer. Fortunately, up on the hill, there is always a breeze. No time to use this, we have work to do! Almost ready for the pickin'. A tray of leek starts is doing well under the shade. grow into this healthy and copious harvest. My favorite type of lettuce had recently bolted. up until temps starting scaling the 90's. changing the growing location could allow for another crop. 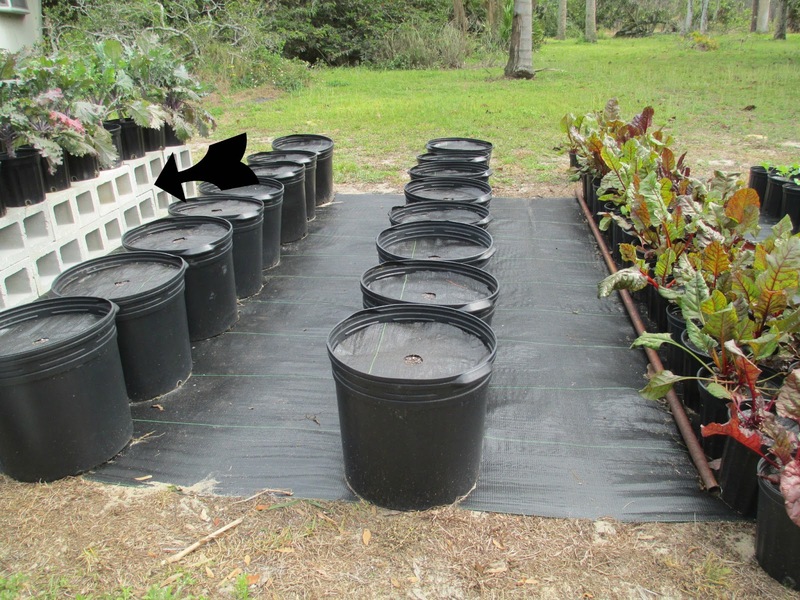 Pots are filled with Lynn's soil mix. A couple of taps on the bottom settles the soil just right. filling all the pots before beginning the next step. It's an efficient way to ensure tasks are uniformly completed. 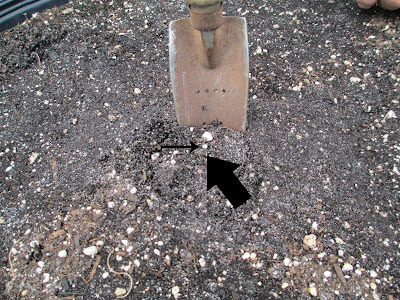 A pre-cut plastic form is placed on top of the soil. See the nail in the middle? That helps to make certain of proper centering of transplants. The form is removed and the dirt is extracted from around the nail with a trowel. The plant is placed in the hole and checked again for center. The plastic ring is placed back on top and two nails keep it secure. We water each plant as it is placed in its new spot. The current location will be under these covers. A plastic overlay is placed on top of the shadecloth. blustery wind and pounding rain. About 30 pots fit under one of these structures. I sure hope it does the trick. I have been Jonesin' for some of this delicious lettuce bigtime. Let's see what else is goin' on here at the farm. The peppers looked like this just a week ago. and getting sweeter every day. in our humid summer climate. (they get their name from their shape). Kohlrabi is another crop that is tolerating the heat so far. Merely weeks ago, the dill seed started sprouting. Now it's filling the same pot to overflowing. This plant reaches upwards of 6 feet. Here's our haul for this week. to anything we could find at the grocery store. but I'll keep working at it. Farm School is swingin' into summer here. while folks further north are just getting started. there is always something to valuable to gain. This is an indigenous specimen called a pitcher plant. and they can't make their way out. The plant actually absorbs the insects. Is it just me, or is that nothing short of amazing? Today we were planting edamame. This is Lynn's seed saved from last season. Eight seeds per pot are planted 2 inches apart in moist soil. The recommended depth is about 2 inches. After I sowed the seeds, Lynn covered them with more soil. It went pretty quickly with both of us working. Some crops are done for the summer. The Swiss chard is not able to bear the heat. until these are restarted closer to fall. but it seems they've given all they can. that he had never seen before Hurricane Sandy came through. The peas have been spent for a couple of weeks. and ripped out all of the remaining crops. These are my favorite food from the farm. It'll be a couple of months before they are resown. and know full well that they are worth waiting for. The tomatoes have suffered their own plight. before they succumbed to disease. Some folks prefer fried green tomatoes. The cherry tomatoes will fare better. These scarlet tidbits are firm, juicy with no trace of acidity. into our mouths as we made our rounds. Love the perks of this job! The okra is comin' on strong. This Southern staple doesn't mind the heat and humidity one bit. And look at the beautiful blooms they produce. Last week I was offered a sample. but I don't think it will win my heart. Maybe it's the Yankee in me. This pepper was looking a bit peaked. and see if it perks up. The leeks are hangin' in there. Lynn showed me that a healthy plant should fan out this way. and will soon be ready to retire for the season. Faye found this brown widow spider. Not deadly, but nothing you want to get too near. Notice the hourglass shape on its back. These find their way into nooks and crannies. Lynn says one of their favorite hiding spots is under the rims of pots. whenever he needs to move them around the garden. Nature provides so much for each of our senses. we can still relish the time spent learning and growing.